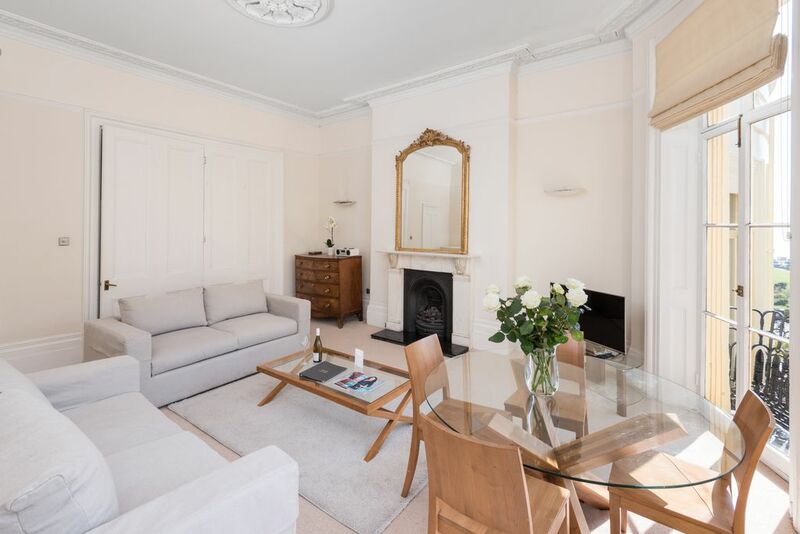 Stunning one double bedroom balcony flat in period property. Original period features throughout. Newly fitted quality bathroom suite. Spacious and light living room and bedroom. Views down to Brunswick Sq gardens and sea. Ideally located for all amenities and tourist attractions. Please note this site charges a high fee for direct online bookings. Please enquire at brightonholiday 'dot' com (first floor apartment) for the best rates. Additional photos and floor/plan bed plans can be seen on my website if you enquire directly for this. Please note the price of this property varies significantly based on where it is advertised based on the charges on each site. My site is Brightonholiday dot com I advertise on most sites and this is the most expensive for you to book via. It is centrally located and within a one minute walk from the beach and many of the best restaurants and bars in Brighton and Hove. Almost all the main tourist and shopping facilities in Brighton can be reached within no more than a ten minute walk including Brighton Sealife Centre, The Palace Pier and The Royal Pavillion, the Historic Lanes shopping area, The Theatre Royal and Kemptown. The flat is ideally suited for couples looking for a short break, or for those with children or those attending Conferences at the nearby Brighton Centre. It is only a 15 min walk from Brighton station. Parking permits can be purchased which allow parking directly outside the flat. These cost £12 per car per calendar day. There is a frequent bus service to Brighton Marina which is situated on the outskirts of Brighton. This property is not only unusually beautiful but also the largest one bedroom property you are likely to find in Brighton and is in fact larger than many two bedroom flats. The location is also perfect as you will see from the photos taken from the windows. It is very close to restaurants and shops and a short walk into the town centre. It is located in the most expensive central Brighton residential location and when you arrive you will fall in love with the location. Like many of my customers will want to come back in the future. The bathroom has a bath with overhead shower. High quality Egyptian cotton towels and toiletries are provided for use during your stay. Egyptian cotton sheets are available. Parking can be arranged and costs £10 a day. Egyptian cotton towels are available. The flat is fabulous. It is clean and uncluttered and I would return there in a heartbeat. The photos show exactly what the flat is like. The lounge is comfy, light, airy and welcoming. The kitchen is very well stocked. We didn’t cook but easily could have. The bedroom is down a few stairs. The bathroom is updated. For us the location could not have been better. There are tons of shops and restaurants around there and bus stops almost outside. It was an easy walk into the center of Brighton. The buses are great, clean and frequent. We rented a car to drive around the area but parking is a real hassle. With the parking permit available to buy (at a steep price) there is parking available usually during the day but by nightfall the spots have been taken and we had to park quite far away at times. The owner recommends walking and public transportation and I second that. (Parking in Brighton/Hove is notoriously hard to come by.) The owner was a pleasure to deal with and responded to us immediately. We would definitely recommend this lovely flat and plan on returning when we are next in the area. Lovely apartment with period features. Could do with some updating but very clean and cosy. Short walk to Brighton city centre and close to the beach. Excellence accommodation for our stay in Brighton. Fantastic apartment for our short stay in Brighton. Property is in Hove, and is about a 20 minute walk to Brighton pier. Well-maintained and location is good for also taking advantage of the restaurants and bars in Hove. Ideal. And we would stay here again. Catherine was very attentive and patient in helping us locate and gain entry as well as providing parking permits. Home was lovely and well located for a short stay in Brighton. Lovely light, airy main room. Perfect location for exploring Brighton. Apartment had everything we needed for a short stay. The property is very pleasant and the photos give an accurate impression. The area is first rate. Central, elegant and smart unlike other areas I have stayed in previously in the city. Facilities locally were also excellent. We had a great time. It was the start of the Brighton Festival and the city was buzzing. The flat is located one minute away from the beach and is within walking distance to all Brighton's main tourist attractions. Please note that all automated quotes from Home away are completely inaccurate. Please contact me directly to get a correct price quote. Please note £25 surcharge for use of the sofa bed for all group sizes over 2. Parking is available at a cost of £12 a day. All other charges are included. Please contact me directly for the price of stays less than a week. Please note Christmas and New Year weeks incur a £200 surcharge on top of the December booking rate.